Haven't we played this hole already? Pros: At the back of an affluent subdivision, a riverside park with a ton of letters in its name now includes a brand-new disc golf course. A popular locale for walkers and hikers, Chattahoochee Pointe Park has recently added concrete teepads and baskets with bright-red banners to its amenities. The course starts with promise as the picturesque wooded Hole #1 is one of the nicest holes. And Hole #2 from the long tee requires some maneuvering by trees. After that, many of the remaining holes feature few obstacles, especially from the short tees. The holes that incorporate trees are the best on the course. Hole #5 is a tricky short hole featuring a narrow and plateaued fairway with modest drop-offs on each side. Holes #16 and #17 return to the woods and while straight-ahead and fairly flat, the basket locations offer a nice challenge. The incredible and detailed signage is typical of other Atlanta-area courses, featuring distance, pin location and elevation change. The "traversability" on this course will be high ... as long as the grass remains short. If frequent mowing isn't performed, the abundant field grass will be difficult to walk in and could gobble up fairway drives. The distance difference between the white (short) and blue (long) tees is substantial at more than 2,300 feet. The pars listed are the same for each distance. There are three par-4s and one par-5. From the short tees, the par-4s are definitely "tweeners" at 385, 390 and 455 feet in length. Cons: Very flat. Like a pancake. The elevation change feature on the signs is irrelevant - there isn't more than eight feet of elevation change on any hole. Repetitive. While the blue tees offer a bit more of direction change on several holes, nearly every hole from the white tees requires a redundant, straight-ahead throw. Few obstacles. While the course design tries to incorporate the existing trees, most of the holes are fairly wide open. Holes #13 to #15 definitely feel like "filler" holes and Hole #18 is a fairly disappointing conclusion. Navigation can be a bit tricky for first-time visitors. The first teepad isn't obvious from the parking lot - facing the bathrooms, turn left and walk down the road a couple hundred yards. And on several holes, throwing to the correct basket might require a bit of guesswork due to adjacent fairways in the wide-open fields. No epic signature holes. While a couple of the wooded holes are nice, they aren't long. And the longer holes are too wide open to be memorable. Other Thoughts: Chattahoochee Pointe Park provides a nice change-of-pace from some of the other Metro Atlanta courses. Despite being flat and fairly-open throughout, the course is a commendable play for those seeking to do "field work" during their round or seek a more casual experience that doesn't involve hitting trees every other throw. Pros: Beautiful scenery, well designed, nice bridges where needed over 'seasonal' criks. Good signage and next tee posts are abundant and useful. Lots of open holes but good use of the tree lines and natural ridges. 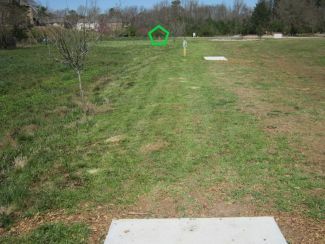 Hole 2 has a cool little straw burm with a gully in it, interesting way to make a 'sand trap' on a disc course. I loved it! Well mowed and bathrooms are super swanky! Hole 17 the Hooch finally comes into play, be careful and stay right! Cons: Needs benches and trash cans but I assume those are to come soon as this course literally just opened, so this Con will probably be removed shortly. Hard to complain about anything here, if you don't like a little marshy wetland area or it is too "flat and open" for you, then you are entitled to your opinion but really, just go play somewhere else! Other Thoughts: Once trash cans and a couple benches are put out there, this will easily be a 4.5+ in my opinion. The only real point of confusion we found was hole 4, being that it is over 900 feet it was hard to find direction and we ended up throwing to 10s basket, then 6s, then back to 4. Just pay attention at this one point and also mind a giant bee hive in the tree next to the ladies' tee for 4 and you should have a great round!